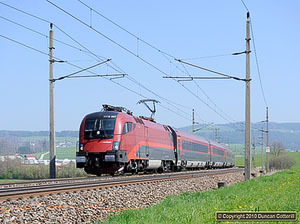 A selection of pictures of the Salzburg - Linz line, taken around Weng and Pöndorf in April this year, has been added to the Austrian Photo Galleries. My last visit to the Westbahn, the main line east of Salzburg, was almost 10 years ago, when class 1142s and 1144s predominated and class 1010s and 1110s were still fairly common on freights. Things are very different today, in the era of Taurii and Railjets, but there are still plenty of loco hauled passengers and quite a few freights, even on a Sunday. 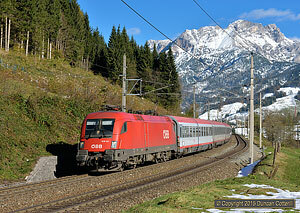 This report details a day trip to the line during my April 2010 visit to southern Germany.